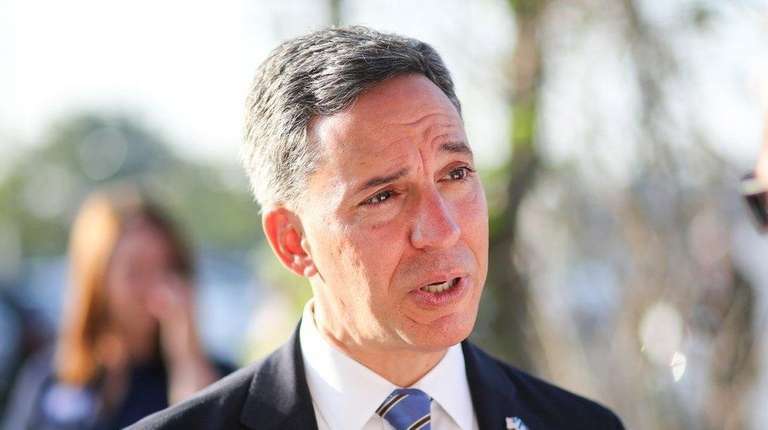 The Civil Service Employees Association, which represents nearly 9,000 Nassau County employees, on Monday endorsed Republican Jack Martins for county executive, citing Martins’ experience and financial reform plan. Jerry Laricchiuta, president of CSEA Local 830, Nassau’s largest Civil Service employees union, said he picked Martins over Democrat Legis. Laura Curran of Baldwin after interviewing both candidates last month. Laricchiuta said Martins, a former state senator and Mineola mayor, has better executive experience and a “solid” plan to end the control period imposed in 2011 by the Nassau Interim Finance Authority, a state monitoring board. Laricchiuta questioned the experience of Curran, a two-term county lawmaker. The union, which typically backs Democrats in national elections, stayed neutral in the 2009 and 2013 county executive races between Republican Edward Mangano and Democrat Thomas Suozzi. Mangano won both contests but is not running for re-election. “CSEA members are hardworking men and women who provide the services we rely on in Nassau County, and I look forward to working with them to get Nassau back on track,” Martins said in a statement. CSEA’s Nassau membership includes 8,700 county employees and 16,000 town, village, city and school district workers. Also Monday, Curran was endorsed by State Comptroller Thomas DiNapoli. “Laura Curran will be the county executive Nassau County needs to end the culture of corruption and mismanagement and return the government to the people,” said DiNapoli, of Great Neck Plaza.